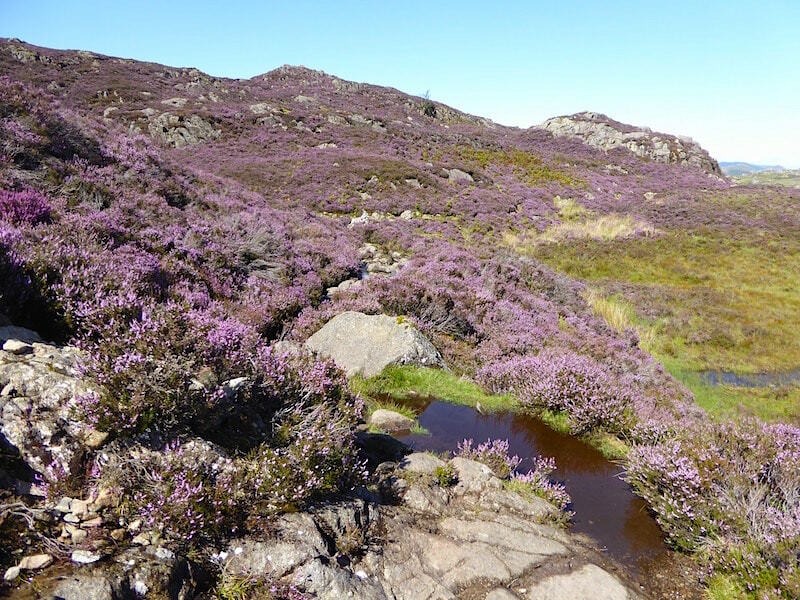 ‘a most beautiful short climb, best done on a sunny day in August, for then the upper slopes are ablaze with heather. 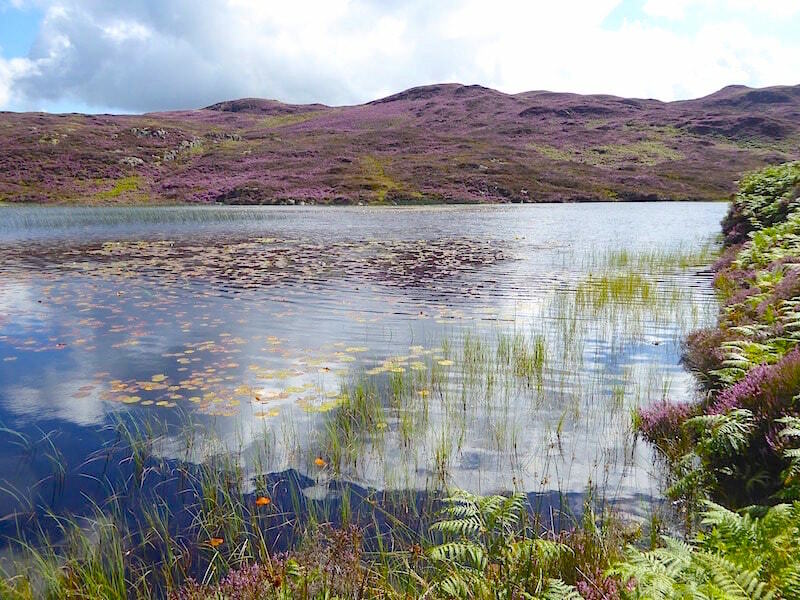 Dock Tarn is a place to lie adreaming, and life seems a sweet, sweet thing’ – Alfred Wainwright. 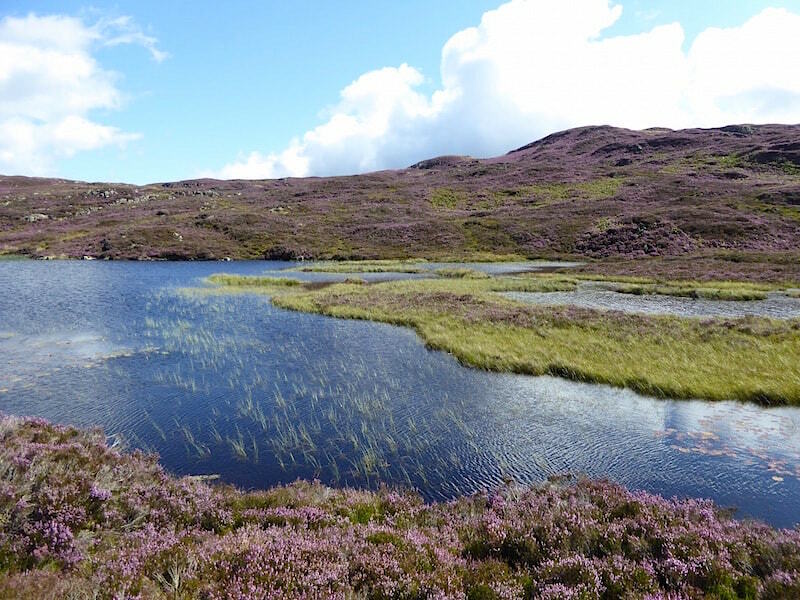 So, seeing as another sunny day in August turned up we thought we should make the most of it and finally get round to visiting Dock Tarn once again and enjoy the sun lighting up the heather and showing it to its best advantage. Its one of those things that you are always going to do but usually forget about until its too late to see whatever show nature is putting on at the time. There was a lot of heavy rain last night and this area is constantly wet and puddly even in the best of summers, which this current one hasn’t been, so there wasn’t much chance of finding anywhere to ‘lie a’dreaming’ though. Life, underfoot at least, was a ‘wet, wet thing’ today and a pair of wellies would have been a suitable choice of footwear. 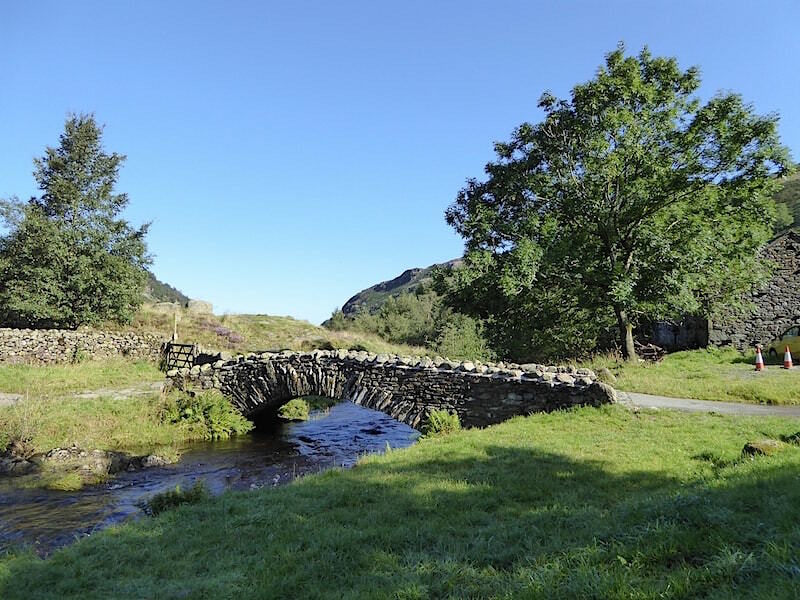 We were the first car to arrive at the car park in Watendlath on an absolutely beautiful morning. We made the effort to get here early since its the height of the summer season and this is a very popular spot with visitors so finding a place to park can sometimes be difficult. As we were kitting up a cheery voice from over the wall wished us good morning and asked “Whe’er yer ga’an?” On hearing that Dock Tarn was on the list the chap said if we wanted to paddle then the “watter’ll ‘ga’an nae further than yer knees’, wished us an enjoyable day and went off about his work. 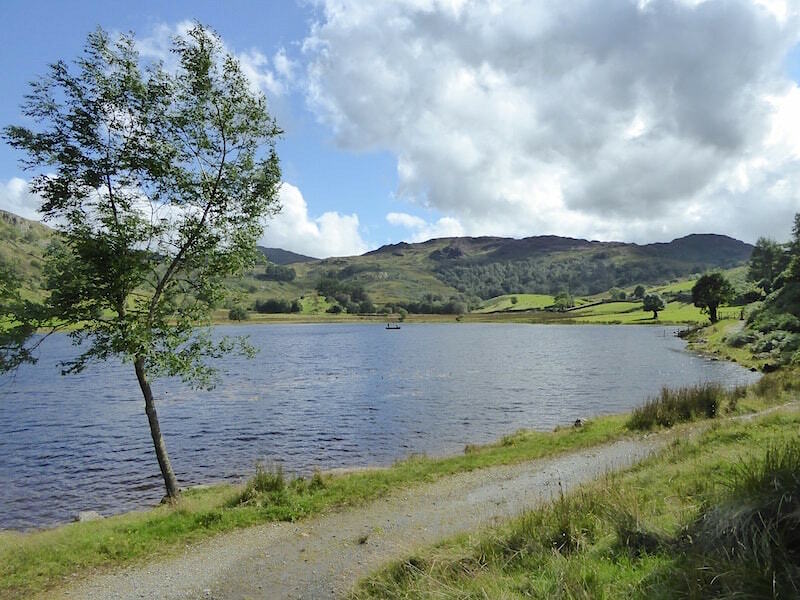 We wandered over to Watendlath Tarn to take a few shots before setting off up to Great Crag, which is the large hump below the cloud over to the right of the photo. 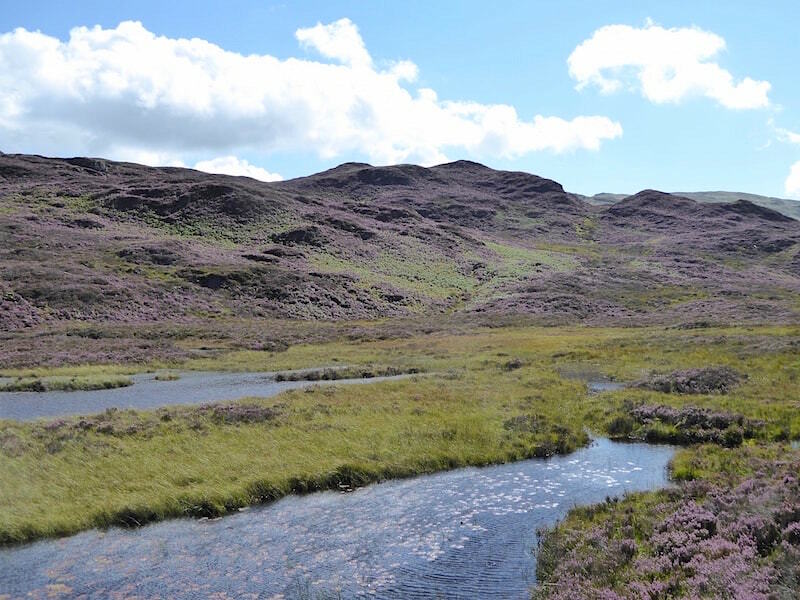 A view from the outflow end of the tarn and on the opposite bank is the path we’ll take up to Great Crag. We turn around and walk to the bridge across the outflow. The repairs to the bridge, damaged during Storm Desmond, are weathering in nicely and the temporary wooden bridge has now been dismantled. I hope they’ve stored the parts, just in case! Across the bridge and we pick up the footpath leading us along the shore and past the nets which prevent the fish escaping. 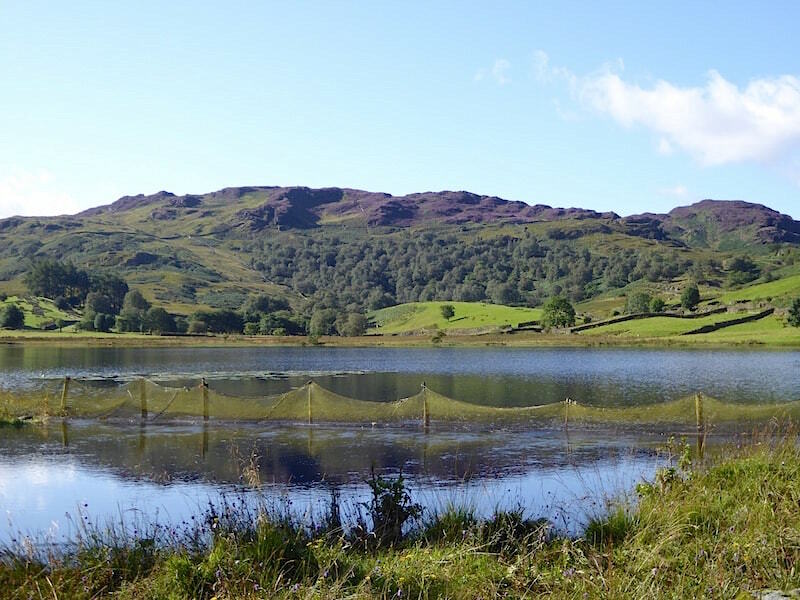 Seven day a week between 1st April and 31st October you can buy a fishing ticket at the cafe and spend a peaceful day doing a spot of fly fishing for trout, either from the banks of the tarn or from one of the three boats which are available for hire. The tarn was quite still this morning, with only a patch of water lilies breaking the surface, so we were treated to some good reflections. 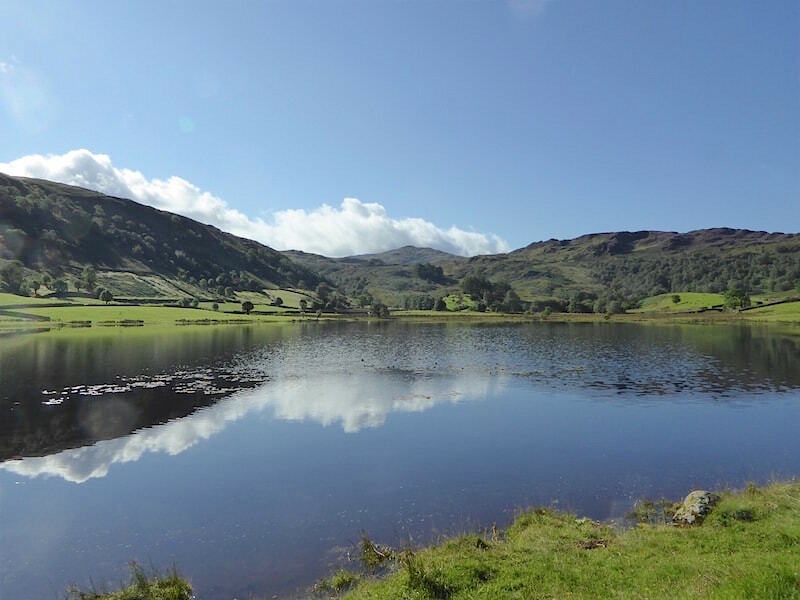 The fell sides above Watendlath reflected in the still water. We’ve just passed through the gate having walked along the green lane behind it. Thanks to last night’s rain the ground was soaked, with water running down every path and gully it could find. Beck crossings were tricky with the water flowing quickly and the levels generally higher than the stepping stones. On reaching this one we had to walk a little way up the beck before we could find somewhere to cross a little more easily. 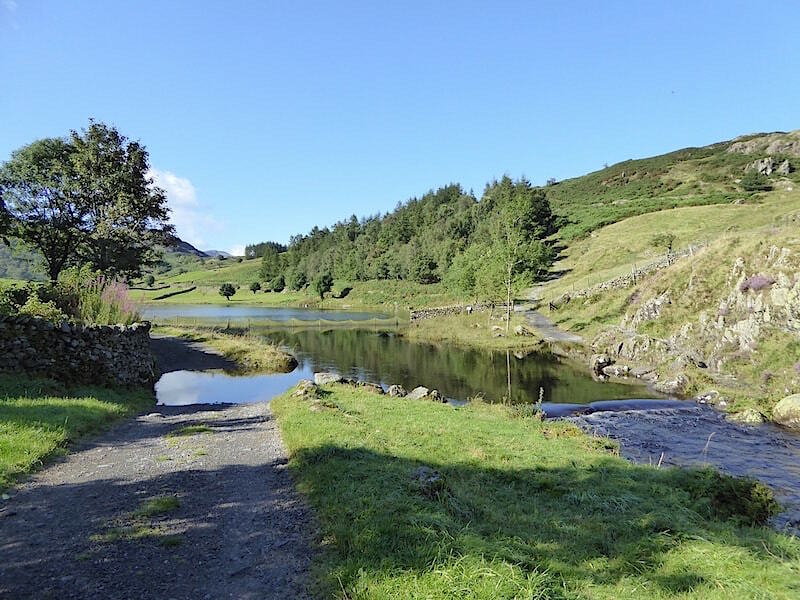 I’m sure any holidaymakers just taking a casual stroll up from Watendlath would have turned round and gone back by now. 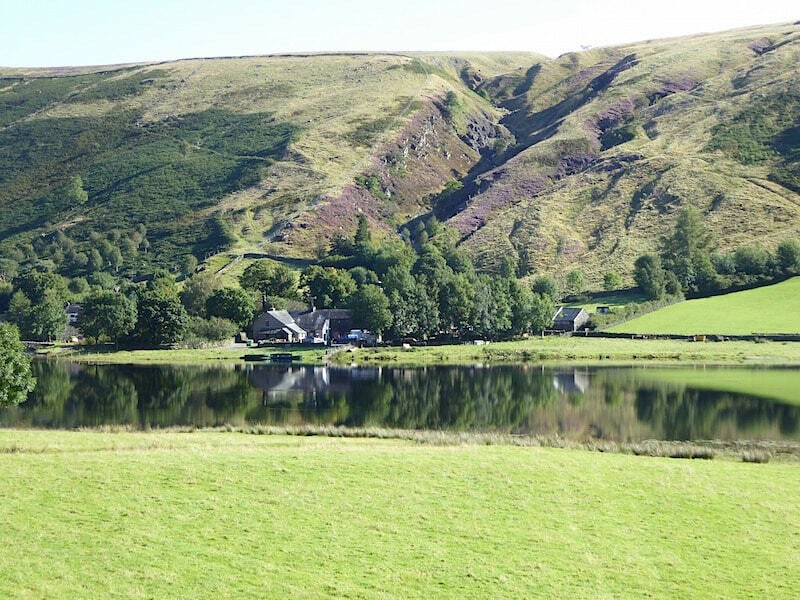 Watendlath and the tarn come back into view as we gain height. Above them the highest point on the skyline is High Seat. From the gate I took a look back across to Grange Fell, that’s the one running across the middle with the rocky, knobbly skyline. 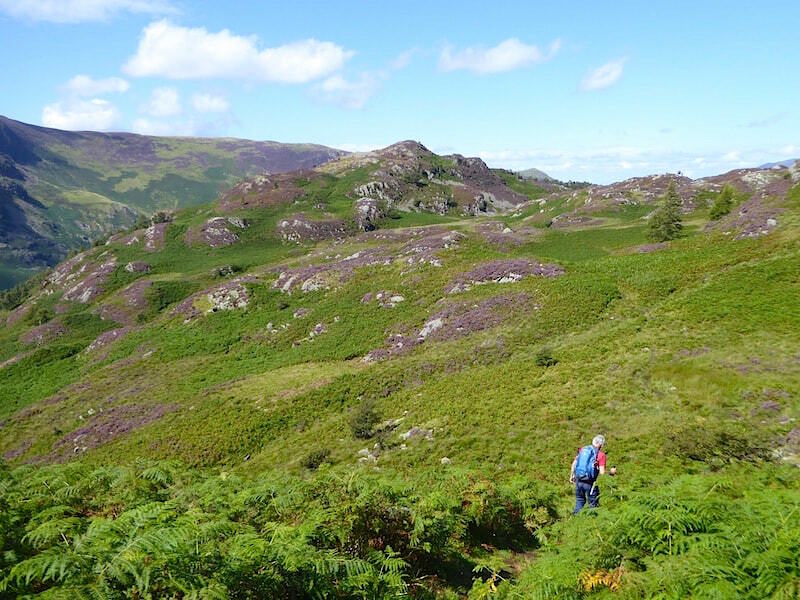 Behind us is the short steep climb up to Great Crag. There is a laid path but once again water had taken it over. 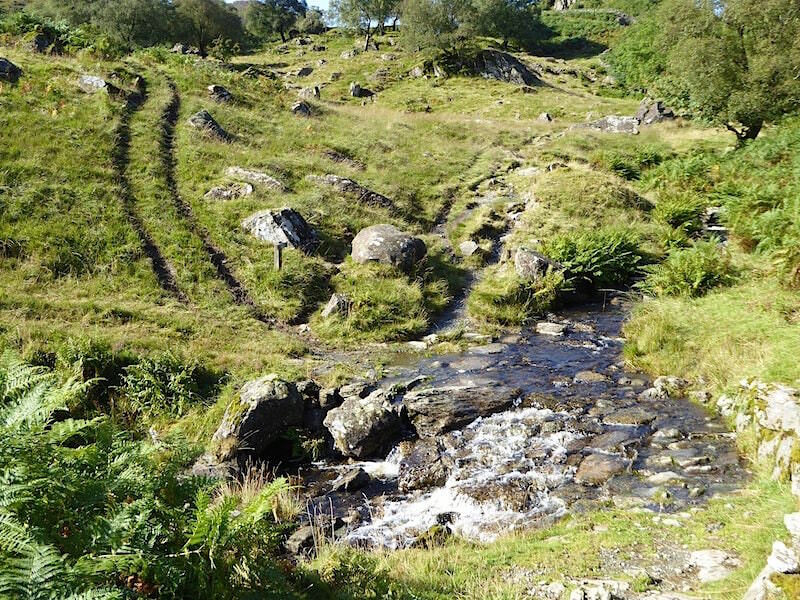 We took a right turn off the main path, which carries on to Dock Tarn, and made our slip-sliding way up the slopes of Great Crag. Once I had some level ground to stand on I took another look back over to Watendlath, its tarn and High Seat. 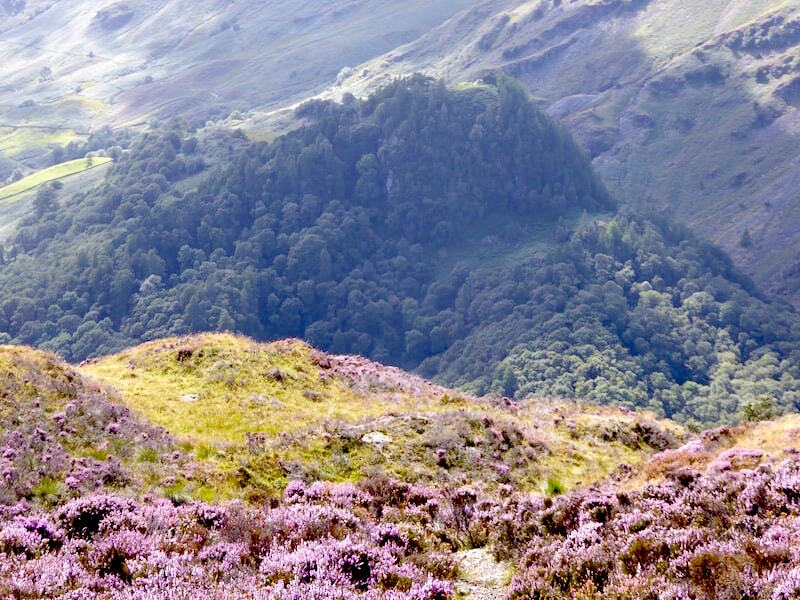 The heather is in full bloom, clouds of pink dust floated up and away as you brushed past it, and the scent was absolutely delightful. 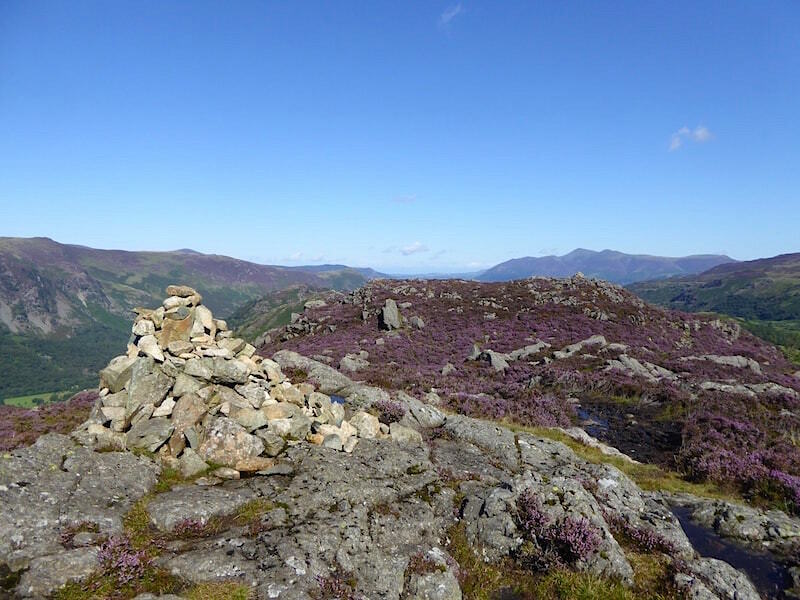 Once on the summit I walked just a few paces west from the cairn for a view over towards Borrowdale. The high fells above and beyond Borrowdale seemed to have more than their fair share of cloud today as later shots will show. 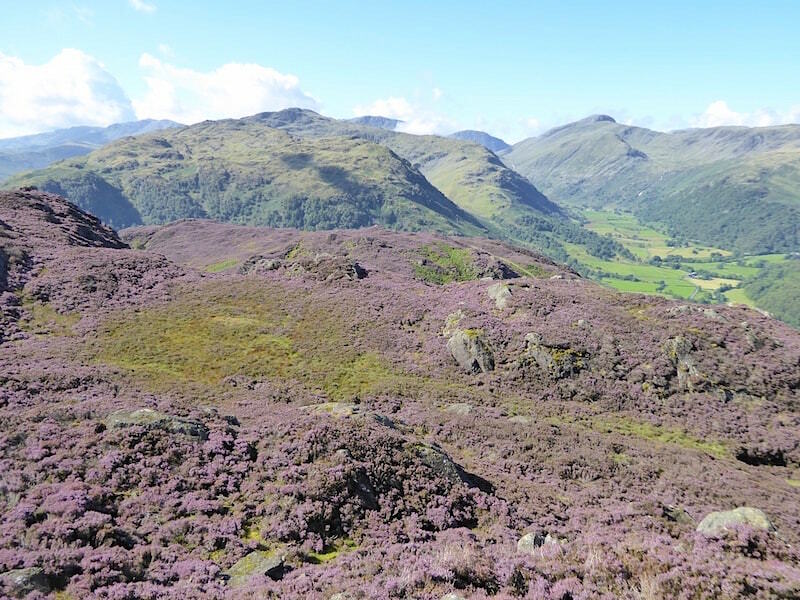 Looking westward across Borrowdale with Dale Head prominent over to the right and Pillar just peeping out to the left of it. 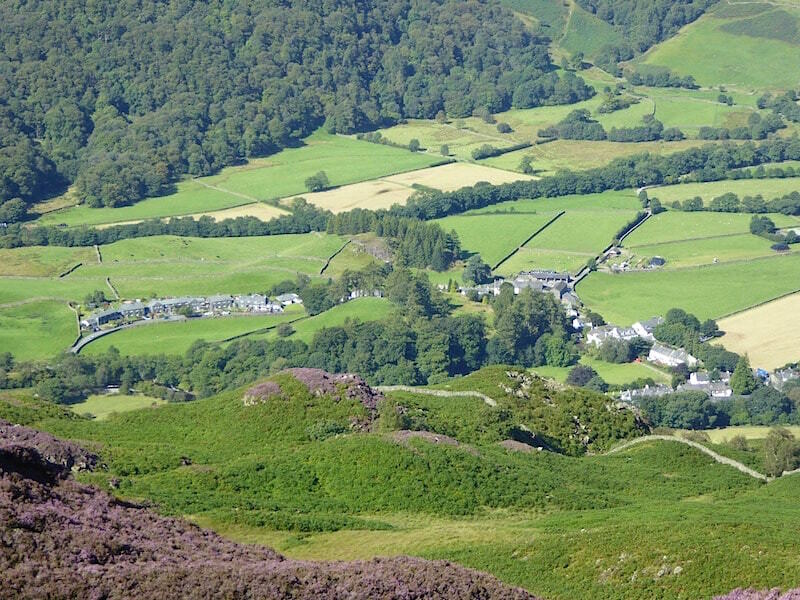 Nestling at the foot of Great Crag is the little village of Rosthwaite. 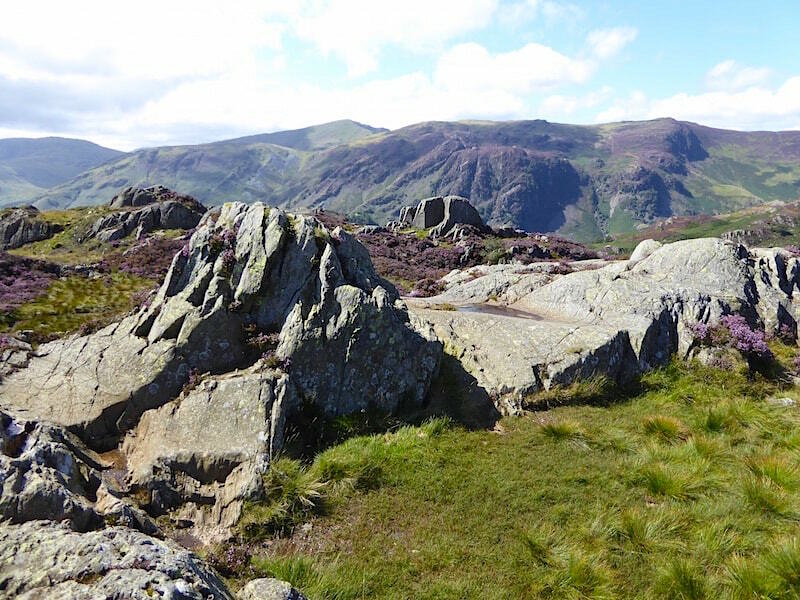 To the north the Skiddaw group of fells are on the skyline and below it is Ether Knott, one of several high points on Grange Fell. From the summit cairn a look over to the east where Clough Head and the Dodds are beginning to appear. 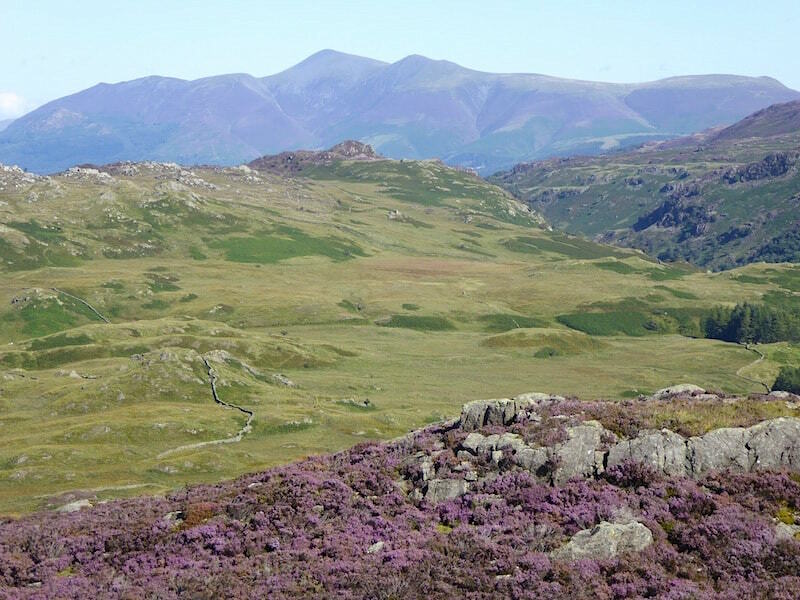 Across the middle foreground is Grange Fell which can be a confusing place with its many high points. 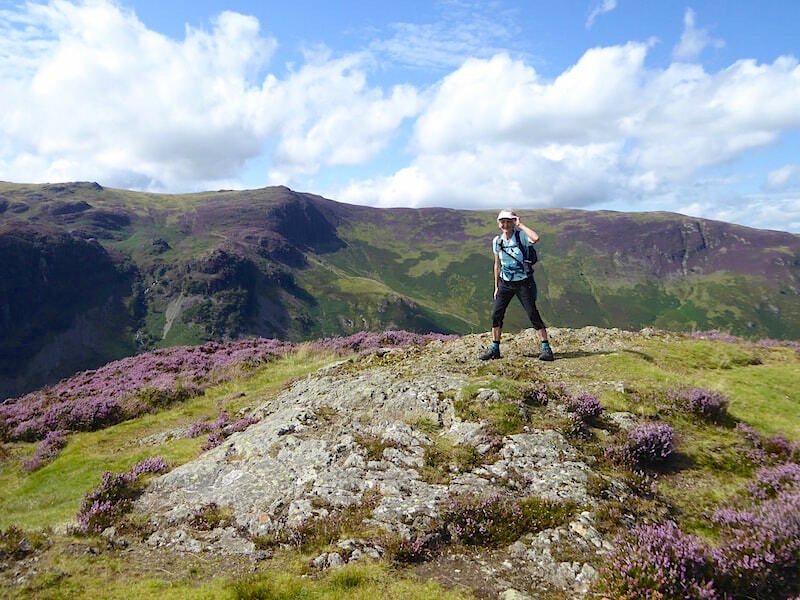 Behind me is one of the high points, King’s How, towards the middle there are a couple of others namely Brund Fell and Jopplety How, and then over at the far end is Ether Knott. Note the squelchy state of the summit area which pretty much sums up the conditions underfoot for the whole seven miles of the walk. 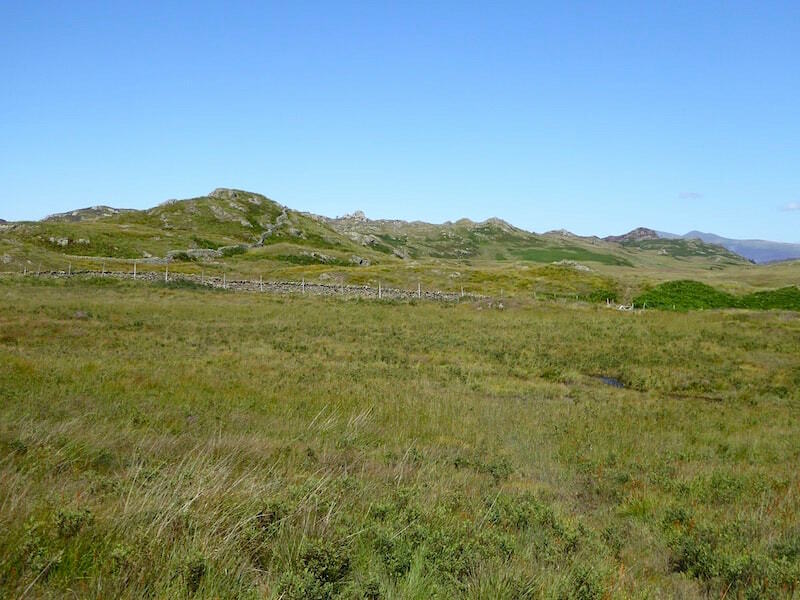 Chancing a shot to the south and across the heather are Ullscarf, the highest point to the left, with the long sweep of Greenup Edge heading across to High Raise over on the right. On the extreme edge of the shot the little pimple peeking up over the skyline is Pike O’Stickle and below that is another cairn on a high point amongst the heather. 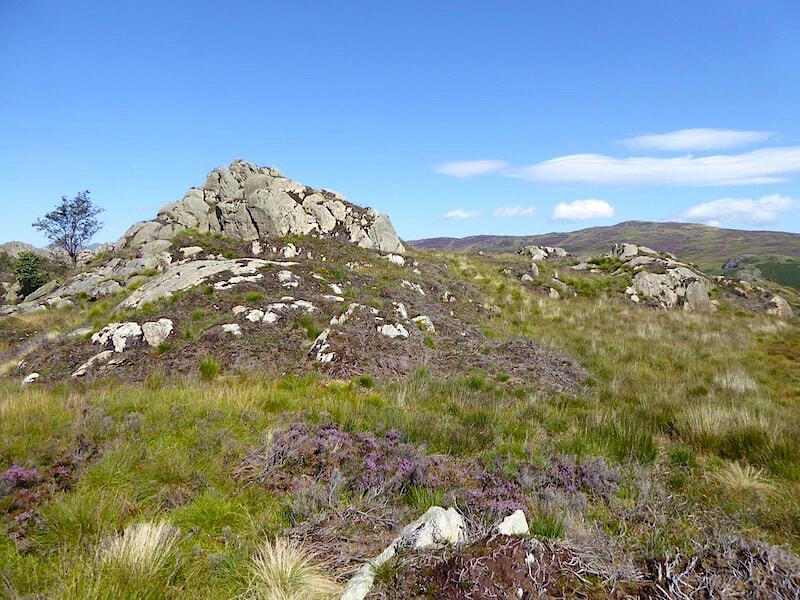 Its only a short distance so we made our way over to it and here’s the view from the second cairn back to the first one. According to the gps this high point is five feet higher than the one back there, which is the generally accepted summit. Not that it matters to us one way or the other, but there will be some walkers around for whom those few feet will matter. 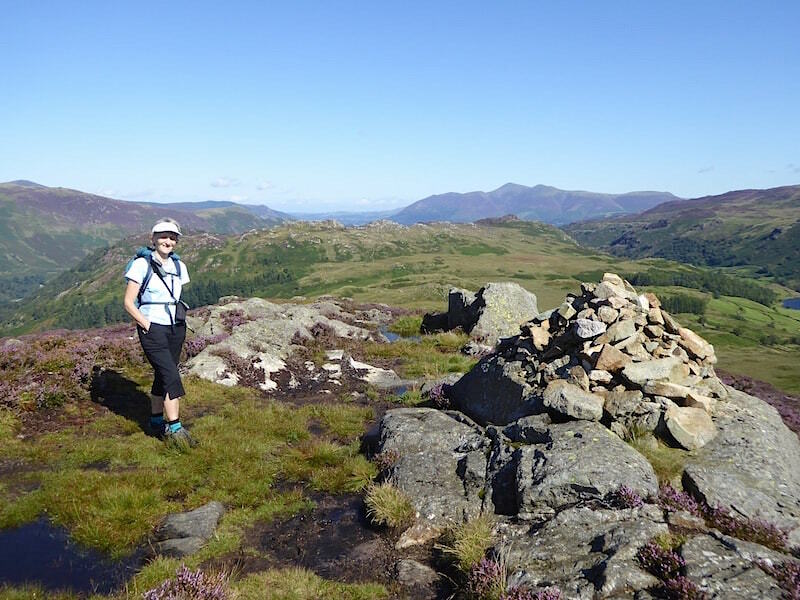 Apparently there are some around who think that if you don’t have a clear view from a Wainwright summit then it doesn’t count as having been climbed. Really? 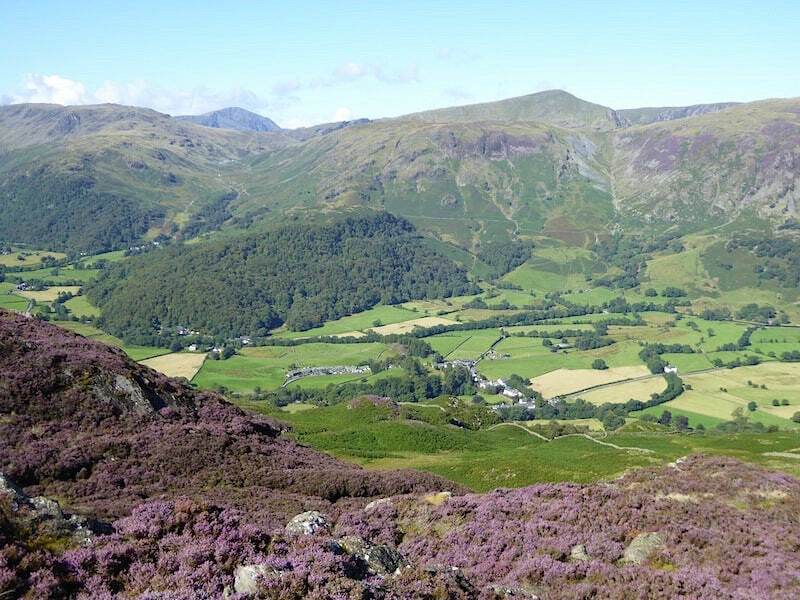 So when you’re standing on a fell summit and the gps is telling you you’re 2000′ plus above sea level, with the surrounding fells obliterated by cloud so thick it could constitute a health hazard, you’re supposed to tell yourself you haven’t really climbed it because you don’t have a view ? Gimme a break! 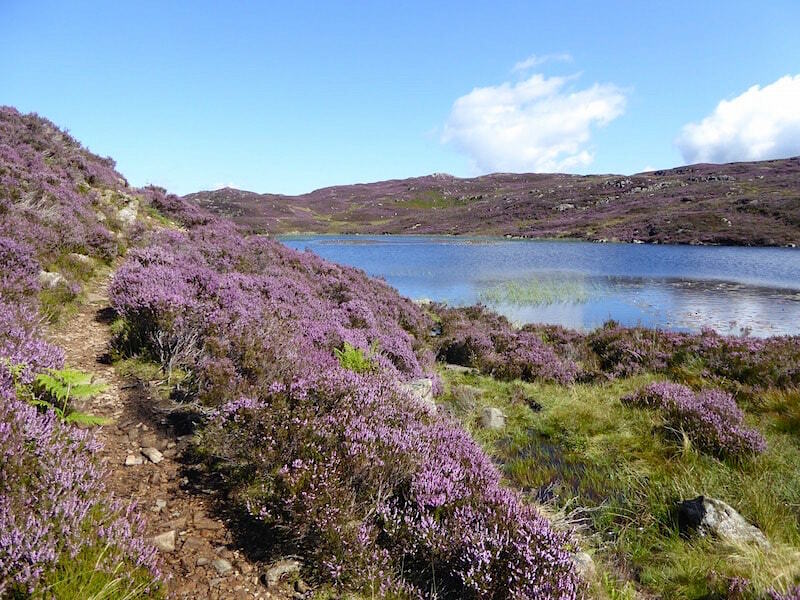 We make our way back down to the undulating and very watery path alongside Dock Tarn from where I took a few shots as we walked along to the other end …..
Banks of beautiful, sweet smelling heather all around us and huge numbers of bees all over it. It almost seemed as though they were overwhelmed by the quantity on offer and would no sooner land on one flower before they were up and away to the next. It reminded me of frantic shoppers stocking up in the supermarket before a bank holiday and rushing from one aisle to the next to grab something else. The bees don’t have the certainty of knowing that the shop will be open again the day after the bank holiday. 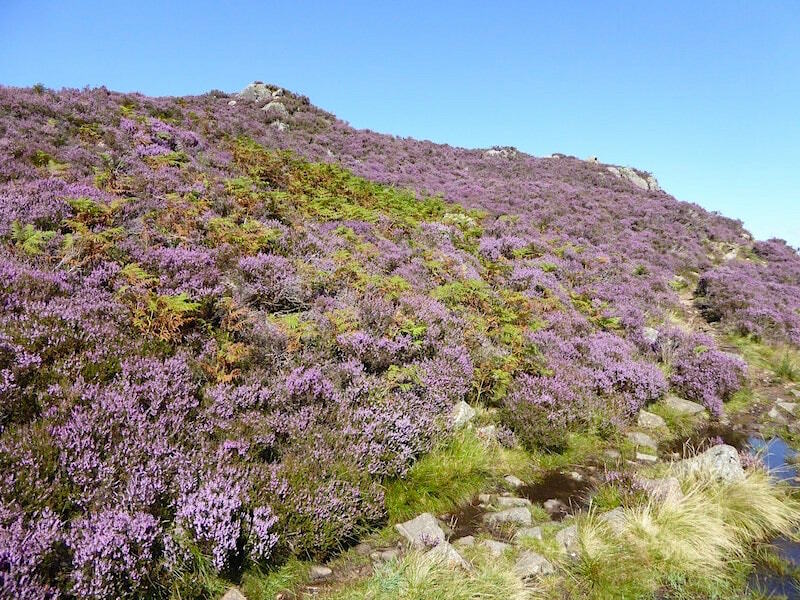 This heather supermarket is open only for a short time after which it will be closed for another twelve months so the bees have to grab it while they can. 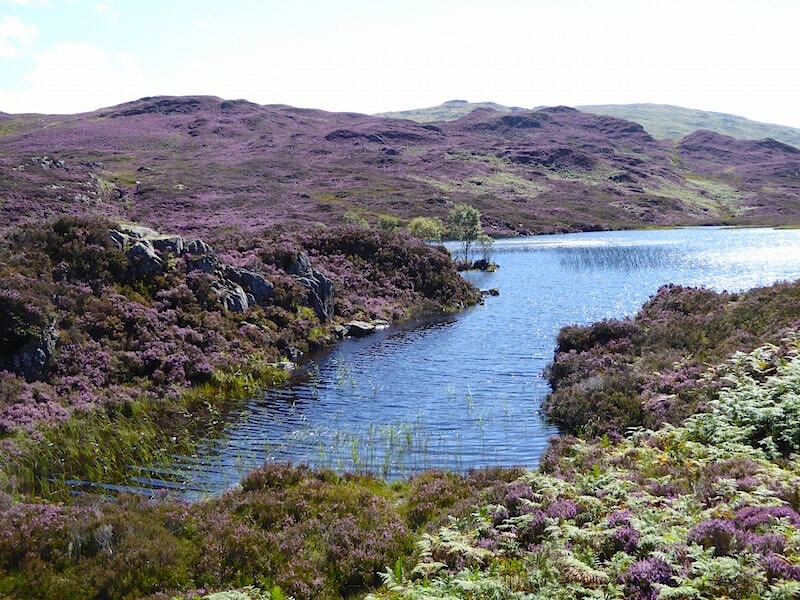 By the way, the blue at the bottom right isn’t the tarn, its the puddly path. 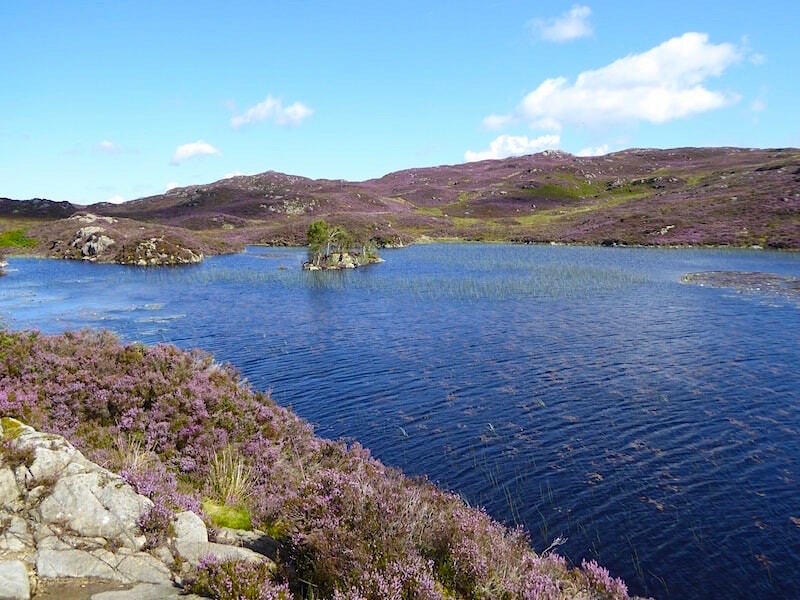 A couple more shots of the tarn as we make our way back …..
From the path a look ahead towards the two high points I mentioned earlier. Mind the puddles. 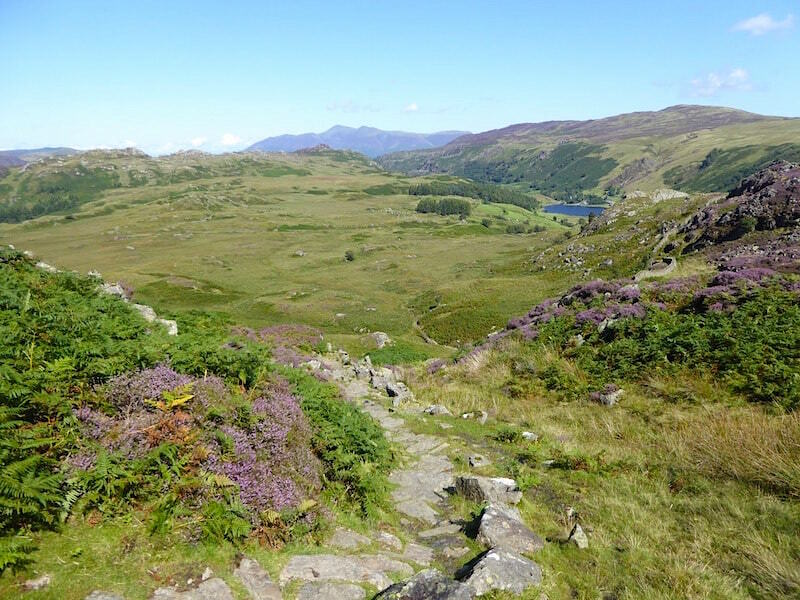 We’ve left the tarn path behind now and are descending the pitched path back to the valley. 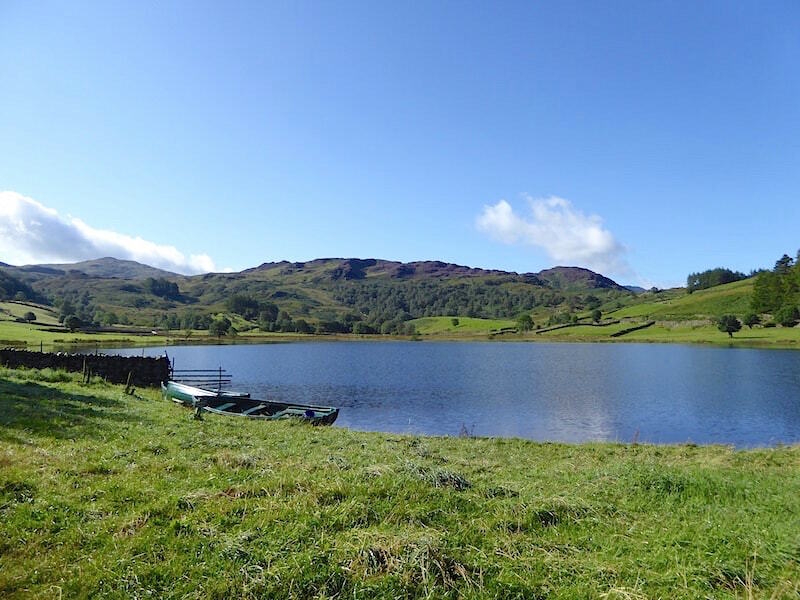 When we reached the gate at the bottom we met three walkers coming up who asked us if it was very wet up by the tarn. To their dismay we showed them our boots and they said they imagined our feet were wet through. Not at all, we replied, the waterproof socks are doing their job and our feet are dry. Their faces revealed surprise that waterproof socks existed and they said they had never heard of such socks. Well they do exist and they work which is why we were wearing them today. If your boots are going to get saturated, and it would have had to be some super duper boot to have avoided that today, then your feet might as well stay dry. Once down onto the valley path we decided to leave it and cut across to the left over to Grange Fell. This is a route that is always soggy no matter what the weather and, having walked over it in the past, we knew what the state of it would be before we set foot on it. 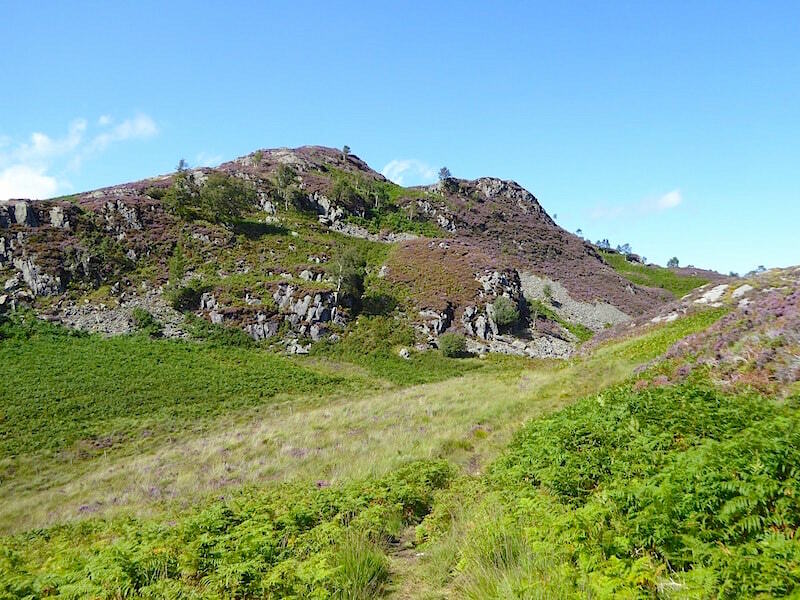 The alternative would have been to continue on the main, and just as wet, path back to Watendlath and then take the Puddingstone Bank path from there up to Grange Fell. That’s the long way round of getting there so across we splodged. 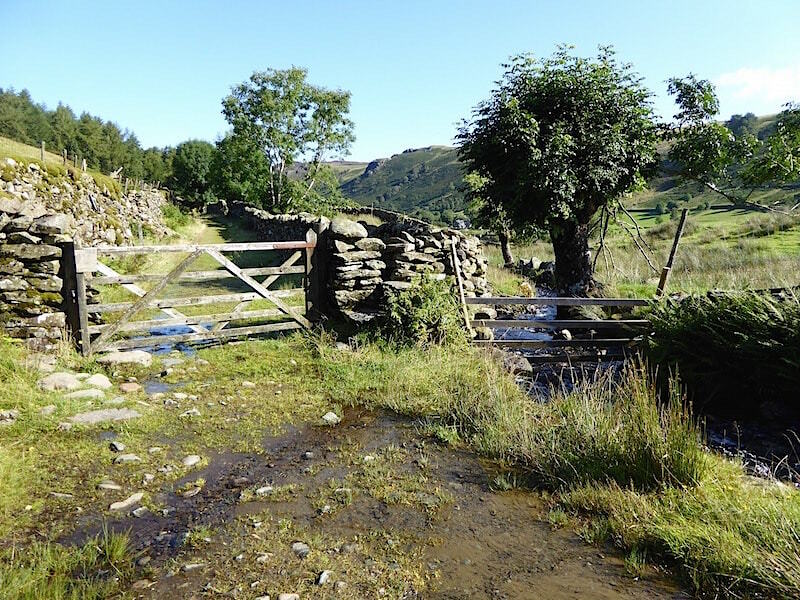 It isn’t a long way and in less than ten minutes we are through the gate and onto a path which in a few places bore a passing resemblance to dryness. 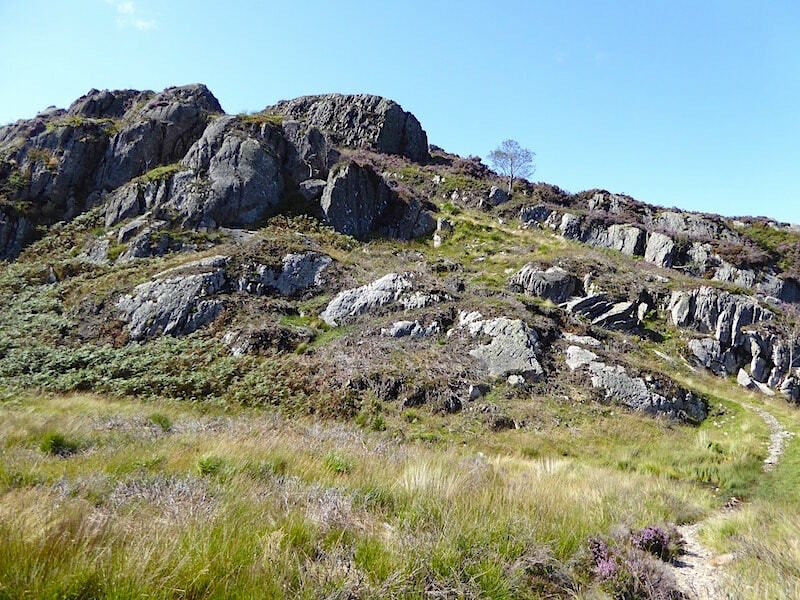 Here’s a look back at Great Crag, on the right, after going through the gate. 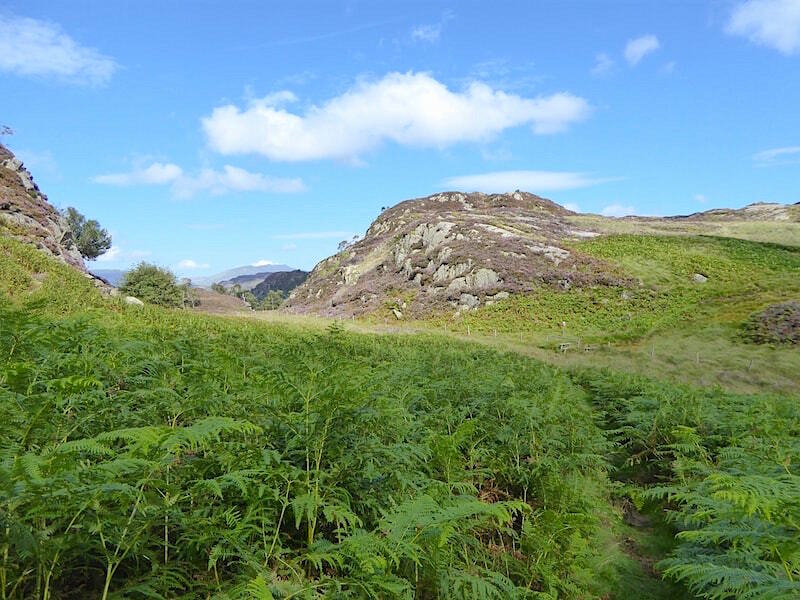 A little further along and the path we are following cuts across the Puddingstone Bank one coming up from Rosthwaite. We’ve had a stretch of level walking for a while but now its time for some more uphill work to get to the stile which we’ll need to cross to be on the correct side of the wall. 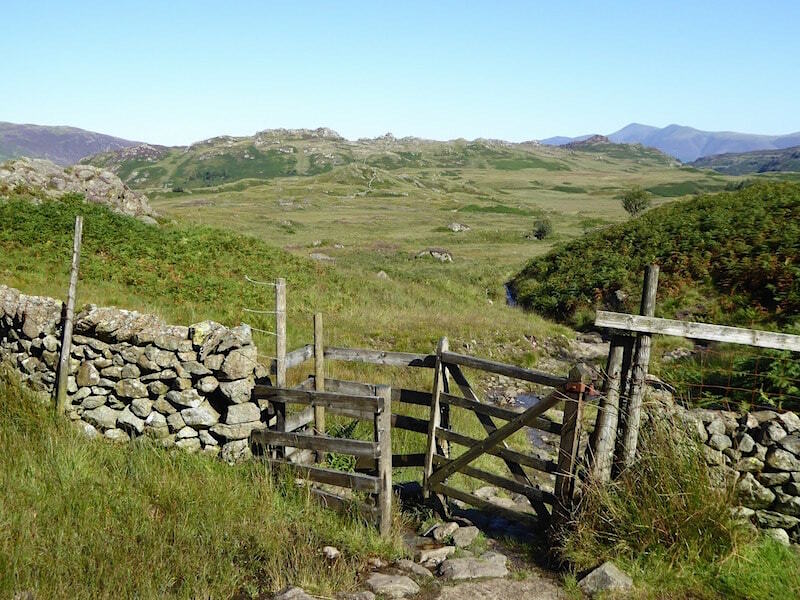 Once over the stile the path winds its way up through the bracken over sodden and muddy slopes up to the summit of Grange Fell. 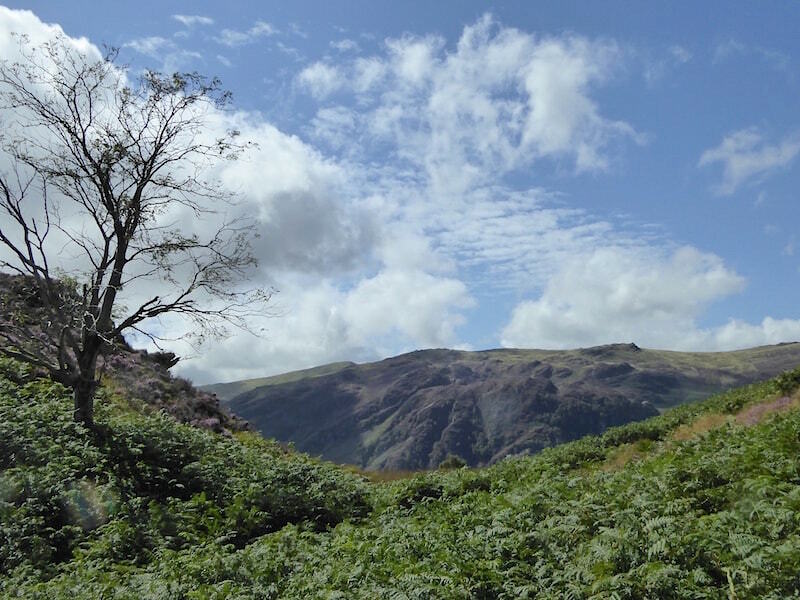 A look across at the cloud building above the Borrowdale fells as we climb up Grange Fell. Not too long after I took this shot a little group of three passed us on their way down. An older chap with what seemed to be two younger family members. He was dressed as though he was off to Sunday lunch somewhere, cavalry twill trousers, check shirt and everyday leather shoes. He obviously wasn’t expecting to be sinking ankle deep in wet and slippery grass when he decided to go for a walk with them. We leave the main path and head over to Jopplety How, the large lump of rock on the left of the shot, to find a sheltered sunny spot in which to have a break and something to eat. 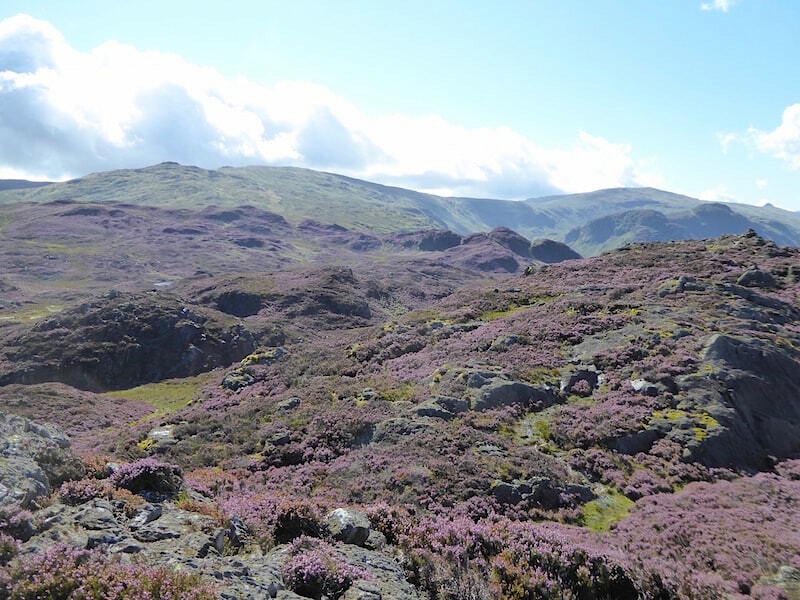 After our break we return to the path and make our way over to Brund Fell, which is the generally accepted summit of Grange Fell. Its a bit more uphill work but its only a short climb so you are soon at the top. A quick look back at Jopplety How as we start to climb. I don’t know how it came by its name but it certainly suits it well because it is very kind of, well – jopplety. 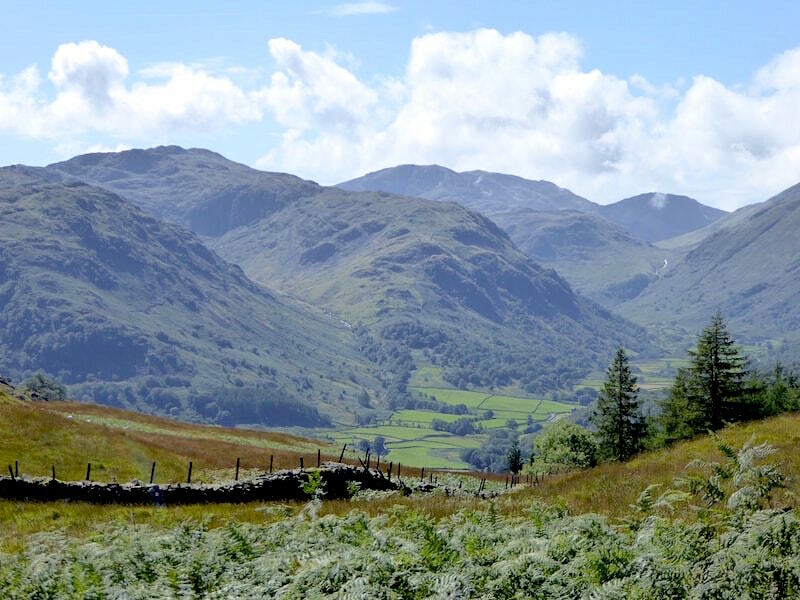 There are lots of unusual names among the fells but this is one of my favourites, jopplety is such a wonderful word. It could almost have been invented by Edward Lear for one of his nonsense poems. 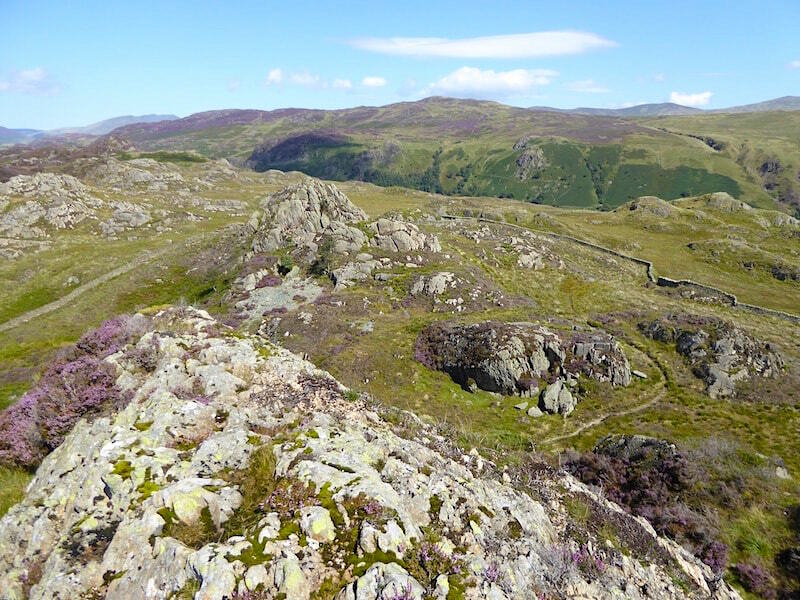 Looking across the outcrops which punctuate the top of Brund Fell beyond which are Dale Head and High Spy on the skyline. 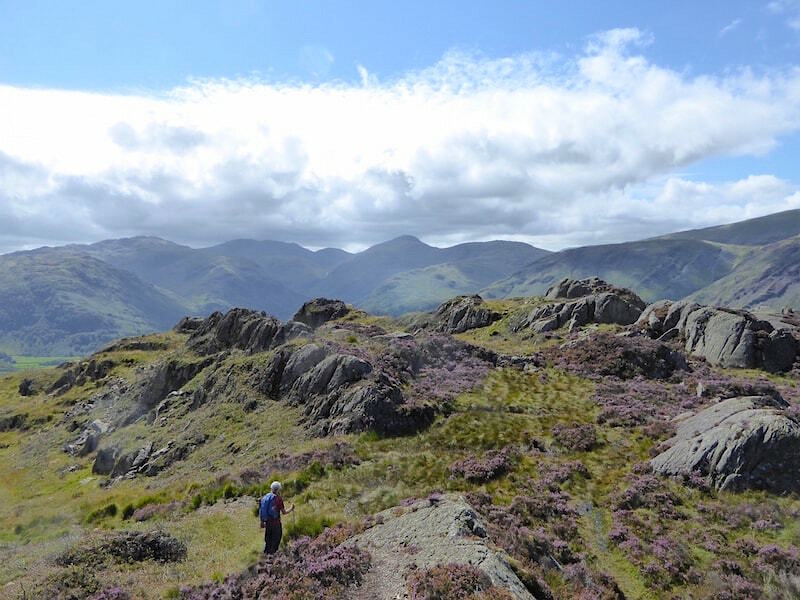 We were joined on the summit rock platform by a very cheery and chatty chap from New Zealand who was escaping the New Zealand winter by taking a three and a half month holiday in the Lake District. He was unsure about which high point was which so we pointed out what was what and after a bit of light hearted chat about the state of his boots, one of which was about to become detached from itself at the toe he headed off in the direction of Jopplety How. Jopplety How below us and High Seat on the skyline, above which lenticular clouds were beginning to appear. From here we were going over to King’s How and the last leg of our return route from there would see us coming across from the wall over on the left, cutting between Jopplety and Brund, and joining the path back down to Watendlath on the right of the shot. We were still in bright sunshine as we set off for King’s How, but the cloud was building over the fells around Borrowdale. Down off Brund Fell now and making our way across to King’s How. We didn’t relish the thought of returning this way as the descent path was steep, rocky, loose and wet, an all round pain in the proverbial. 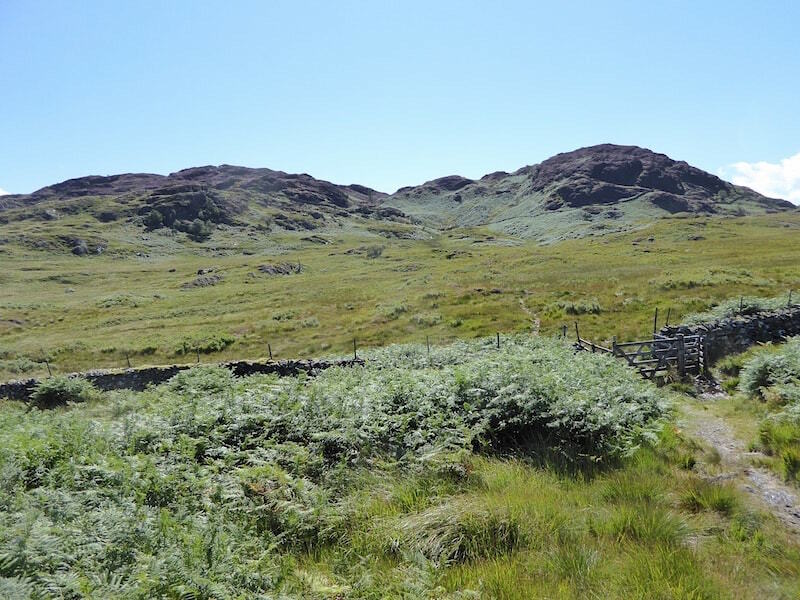 Its not obvious in the bracken but a little further along from here we passed through a hand gate in a wall. 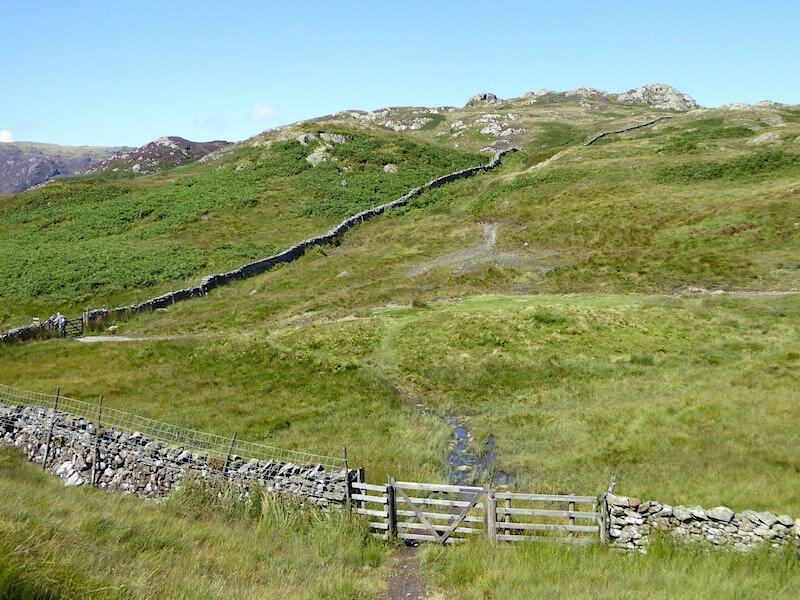 The wall straddles the fell from east to west so we decided that as we came through the gate on the return leg we would turn sharp left and follow the wall back up to the Jopplety How area. Approaching King’s How, on a path as sodden as all the others, with an even soggier area waiting for us at the stile in the dip between the two slopes. But let’s look on the plus side, there might have been a big pool of water around the stile but at least there were no nettles. Why do nettles seem to love growing around the bottom of stiles? You could probably place a safe bet on there being a patch of them around any stile you come across even if there were no nettles for a good number of yards around. 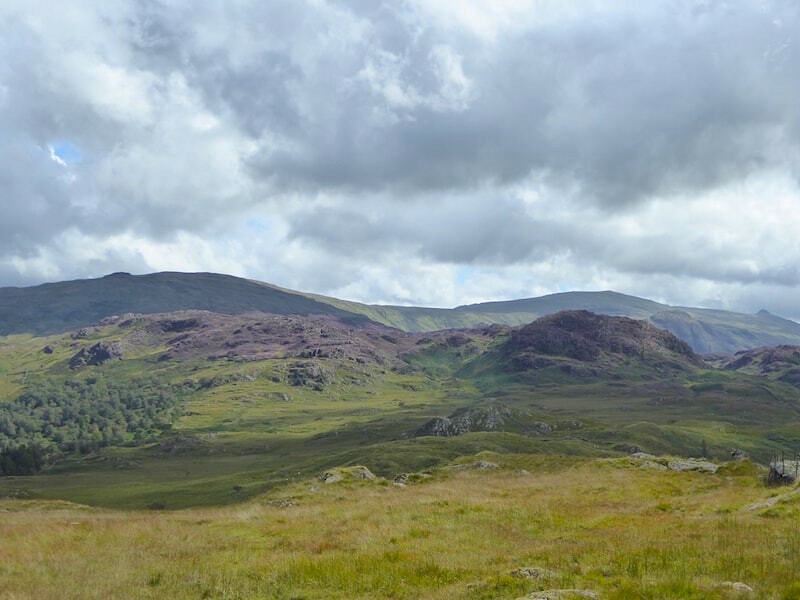 A look across to Brund Fell as we begin our climb up King’s How. 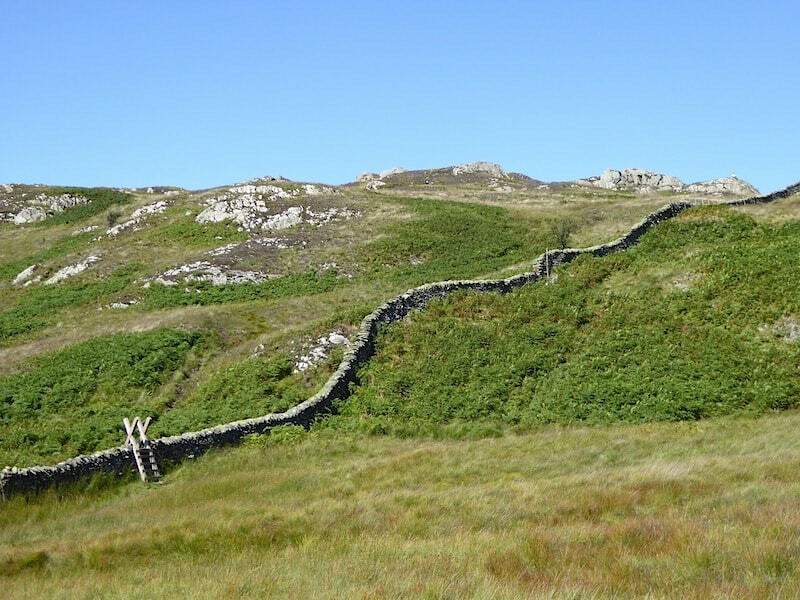 The wall I mentioned earlier can now be seen going up the fell side just below Jopplety How over on the left of the shot. There are bits and pieces of a track up there but nothing by way of an engineered one, and in keeping with the rest of the area, the ground is squelchy. 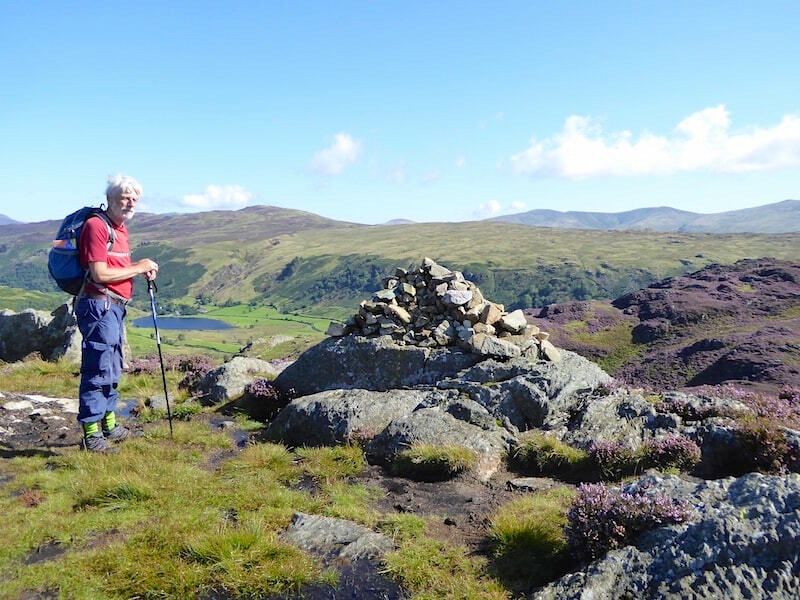 On our left there’s a glimpse of Dale Head behind High Spy as we make our way up King’s How. 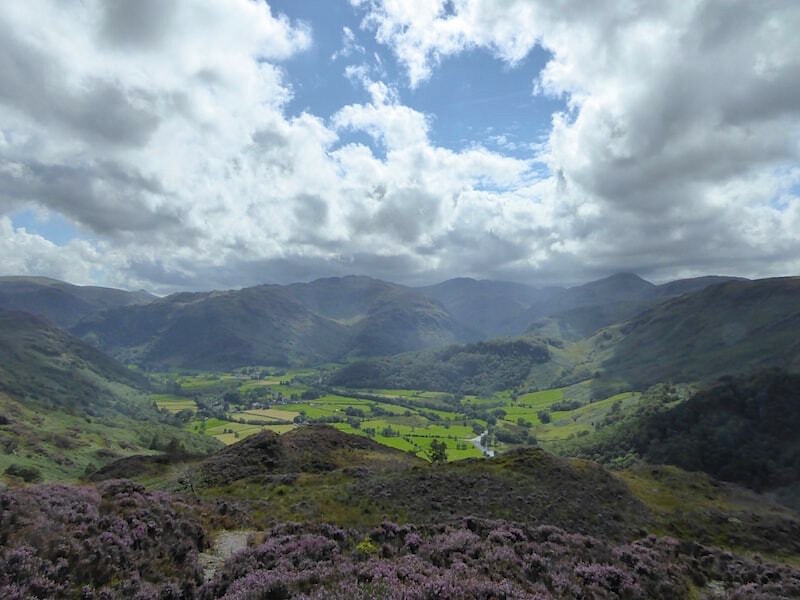 The cloud which had been hanging over the Borrowdale fells is now increasing and beginning to spread out towards us. On the top of King’s How where the views are much more open, and therefore so much better than they are from the top of Brund Fell. 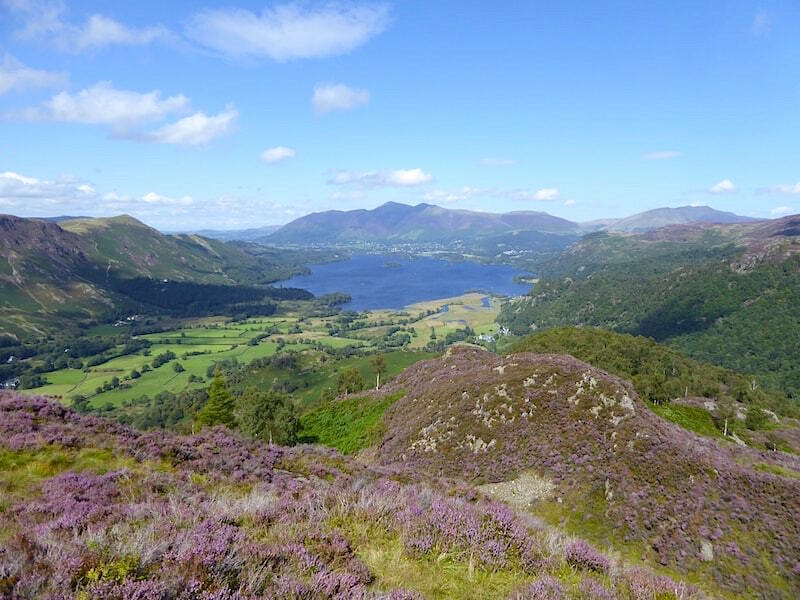 This is looking northwards, directly along Borrowdale, to Derwentwater, Keswick and the Skiddaw group beyond. The viewpoint was purchased by Princess Louise, then President of The National Trust, following the death of her brother, Edward VIII, in 1910. She gifted it to the nation, through the National Trust, as a sanctuary of rest and peace for everyone in memory of the late king, and hence the name King’s How. 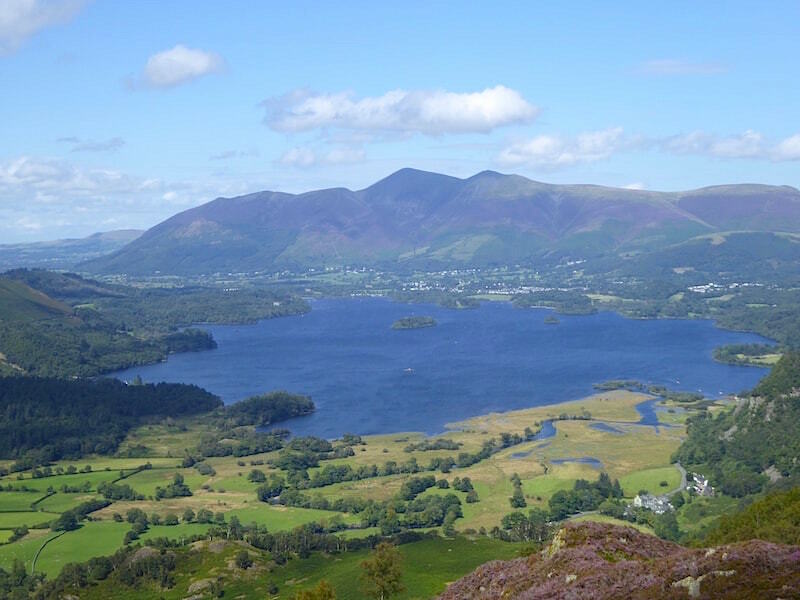 A closer look at Derwentwater and the Skiddaw group. A shaft of sunlight beams down on Borrowdale, but the fells beyond are now in deep shadow and becoming greyer and murkier by the minute. 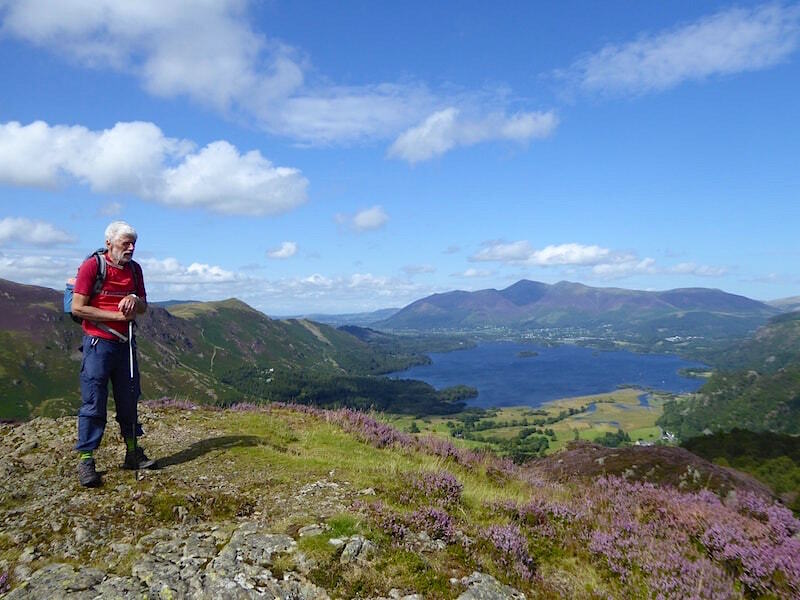 We are still blessed with sunshine …..
….. but it was very breezy up here and the headgear needed a firm hold to keep it from being hurled down towards Derwentwater. 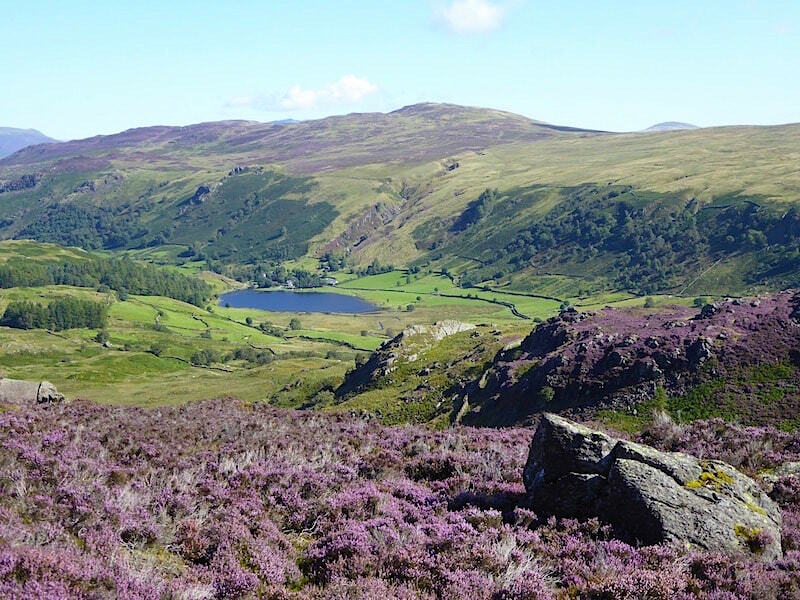 Behind me Maiden Moor also has a good covering of heather blossom which, together with its summer greenery, gives it a much more appealing appearance than it normally has. 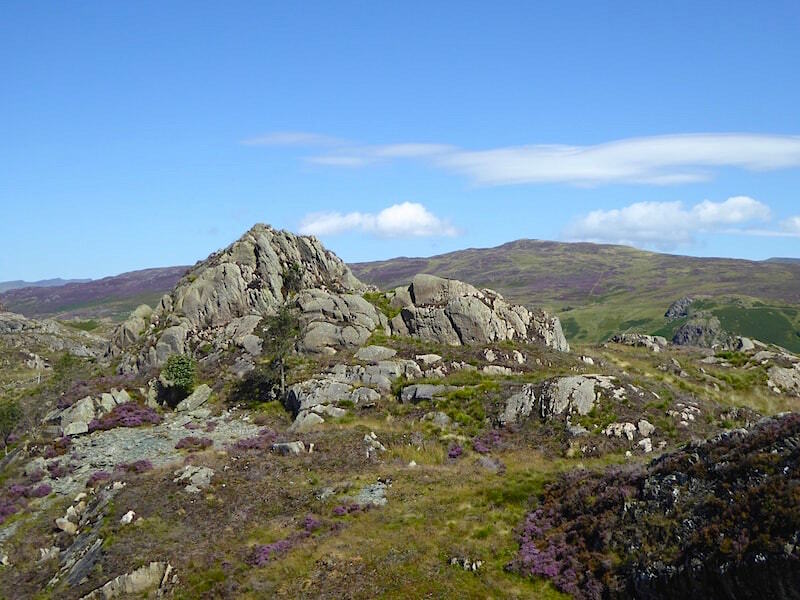 Below us is the most diminutive of the Wainwright fells, Castle Crag, standing at just under one thousand feet.The summit area doesn’t look as if its crowded with visitors today. We turn to begin making our way down and who should we meet once again but the cheerful, chatty chap from New Zealand. 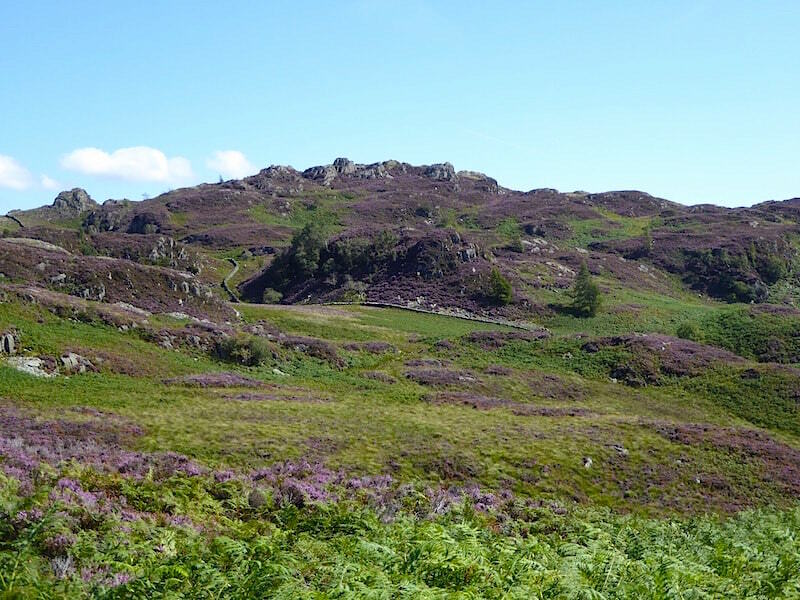 He had done his exploring over on the Jopplety How side of the fell and had now crossed over to take a look at King’s How. Once again we had a chat during which he told us he was here until 9th October so he still has plenty of time to do lots more exploring before returning to the South Island where he lives. Leaving the New Zealander with our best wishes for decent weather in which to enjoy the remainder of his holiday we made our way back down King’s How and return through shoulder high bracken back to the watery stile crossing, which can be seen at the end of this section of path, and then to the right across the fell side to the gate in the wall. From the left turn through the wall gate we follow yet another watery route across to a ladder stile at another wall corner, from where I took this shot looking across to Great Crag with High Raise on the skyline behind it. 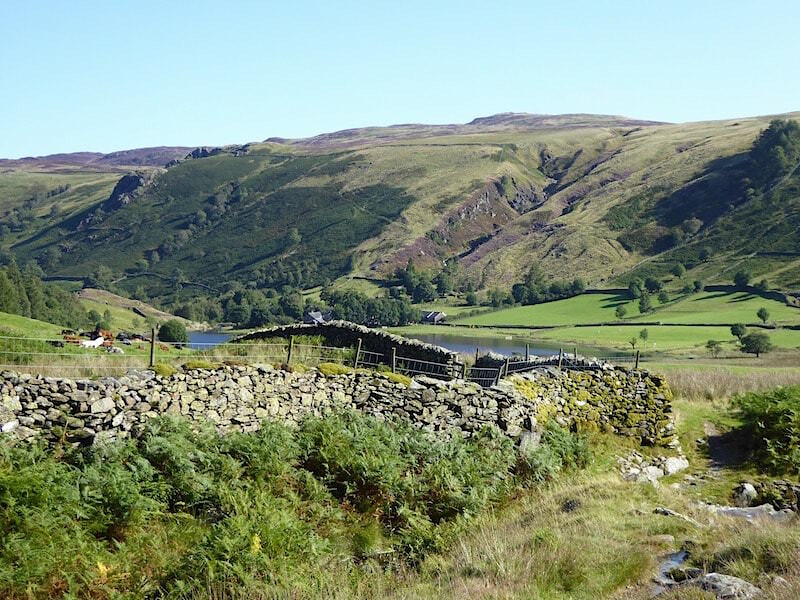 All we have to do now is make our way across to the left where, in the dip below, we meet up with the firm, dry path coming up Puddingstone Bank which will lead us back to Watendlath. 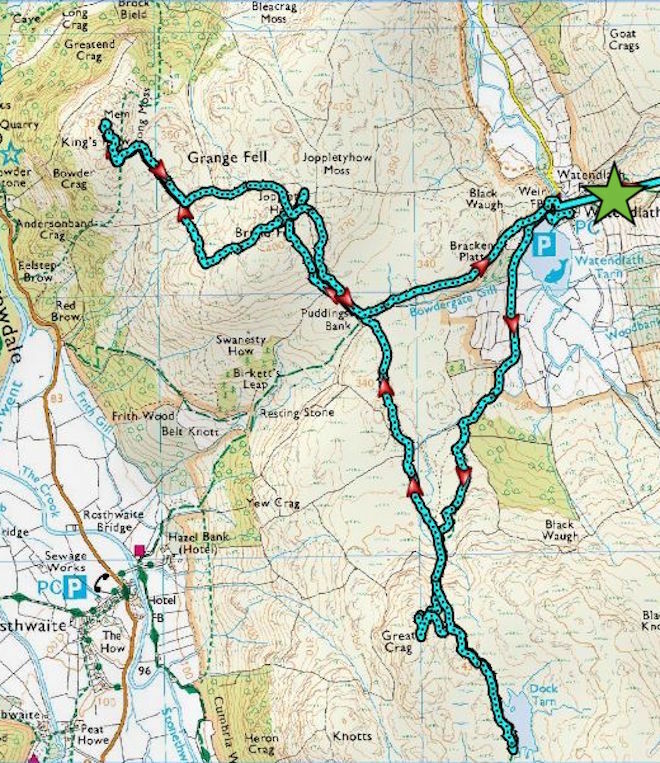 Back at Watendlath Tarn and the path we have returned on meets up with the one we took over to Great Crag this morning and so we have come full circle, although our route map is more reminiscent of a strand of leftover spaghetti than a circle, but you know what I mean. The breeze is quite strong down here now and is ruffling the surface of the water, and two fishermen have hired a boat and are enjoying an afternoon’s fly fishing. We walk back to the bridge and as we cross over notice that the cafe is open so we treat ourselves to coffee and cake. Well it would be churlish not to wouldn’t it, when someone had gone to the trouble of opening up, getting the kettle on and the cakes out? We sat in the cafe garden beneath trees, which were adding to the flavour of our coffee and cake by dropping their tiny seeds all over them and us, and reflected on today’s outing. Yes, its been very wet underfoot, but then it always is in this particular neck of the woods, and on the plus side we enjoyed a truly sparkling morning and a very warm and sunny afternoon. 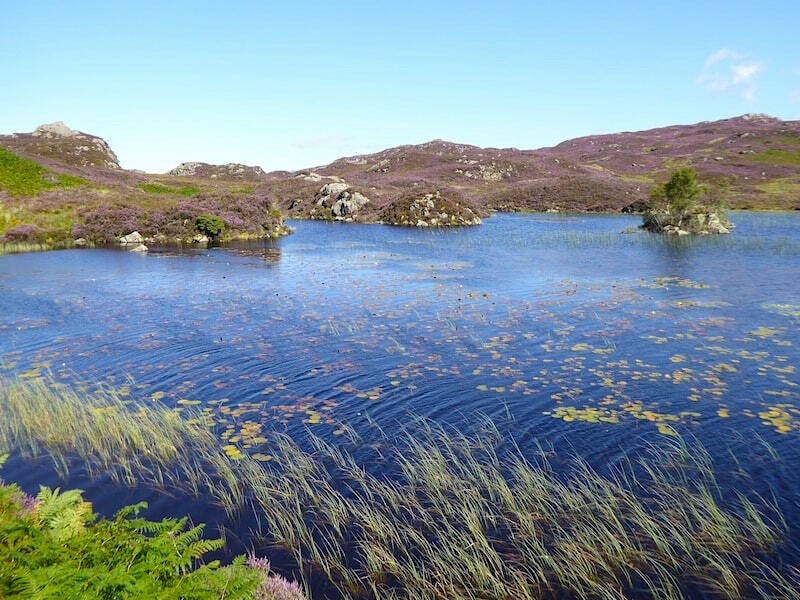 The twinkling waters of Dock Tarn and the vivid purple banks of sweet smelling heather surrounding it were simply lovely to look at and added some extra special icing to an already delicious cake of a day.